Lush is a store that you can smell from a block away. The scent is so what intense for sensitive noses. However who can resist these fresh handmade goodies. Happy Pill – Grapefruit, bergamot, frankincense, lemon, orange flower and mandarin for a calm, relaxing, frothy fizz. The Happy Pill combines two of our favourite shower gel scents to bring a bit of sunshine to gloomy days. 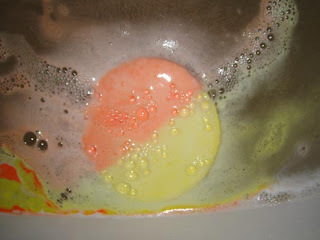 The orange side is the mandarin fragrance of Olive Branch and the yellow side is our gloriously grapefruity Happy Hippy. Pop a Happy Pill and smile. Husband picked this up because he likes the name “pill”. What a dork! Supernova – Celebrate bath-time with cocktails for one and a ticker tape parade. 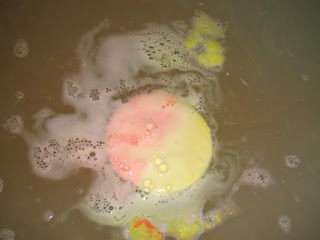 Supernova is a party explosion in your tub, with refreshing oranges and genuine cognac oil to make it smell like a posh cocktail. 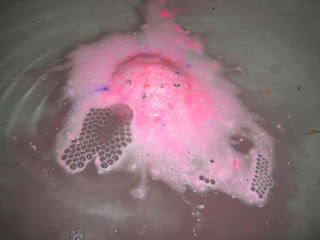 Smatterings of fluorescent bubble mixture give it a frothy, pink topping. The paper takes a bit of clearing up afterwards, but it’s definitely fun while it lasts. Oh I didn’t know that it’d be a hassle to clean up the confetti bits but it’s so worth it. Street Party (LE) – Some celebrations need to be taken to the streets – New Year’s, birthdays, sports finals and national holidays with all the requisite noise makers, streamers, and dancing. For the ones where your first inclination is to strip down, head to the tub with Street Party. You’ll have your ticker tape and glitter in all its glory, and soak in the decadent scent of a champagne cocktail all while avoiding citations from law enforcement. Have a Street Party while you can, it’s only visiting for a limited time. How can I not buy this?! It has a cute American flag and it’s only $4.95. Magic Mushroom (LE) – A tempting toadstool to bewitch your senses. Our new, mushroom-shaped Bubble Bar has the scent of sweet vanilla and delicious citrus fruits to cast a spell upon those relaxing in the creamy bubbles. 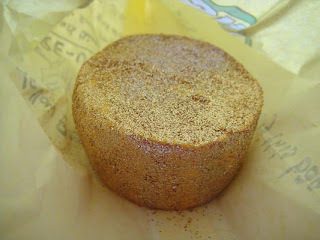 Unlike its namesake, this is a perfectly legal high for everyone to enjoy. Although sharing a Valentine’s bath can be very enjoyable, you may not have mushroom for anyone else with this fungi. This one is already sold out on the Lush US website. I guess it’s a hot item because of the Alice in Wonderland movie. Everything related to “mushroom”, “rabbit” is going to sell. Sakura – In Japanese, Sakura means Cherry Blossom, the gorgeous white and pink flowers that bloom for just a brief period of time in the Spring. Relax into the warm water as the pretty pink and blue sea salts dissolve just like your cares. Imagine cherry blossoms softly falling as you inhale the fragrance of jasmine, mimosa and orange blossom (what we think Cherry Blossoms should smell like). You’ll feel as beautiful as the transient blossoms. Just by thinking of the name, I have a feeling that it’s going to be good. I like everything “sakura”. I really wished that the Starbucks here have the sakura tumblers and mugs. Not to talk about those special drinks and snacks. Asian people are so lucky. 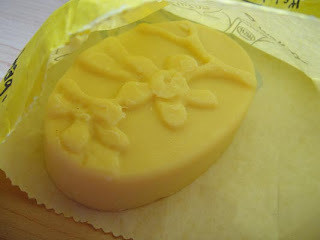 Sunny Side Bubble – Sparkly golden bar with citrus scents to bring you sunshine. 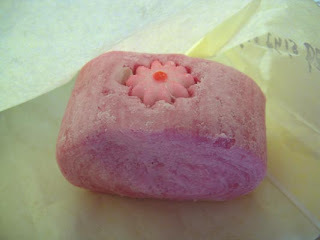 If you’ve had a bad night full of disappointing dreams and wake up feeling a bit glum, pop one of these in the bath. Even as you crumble it under the running water, you’ll start to feel better. Maybe it’s because citrus fruits only grow in warm, sunny places that their scents make us feel like smiling again. 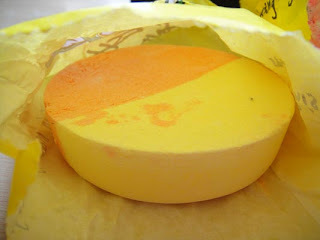 Sunny Side’s orange, tangerine and lemon help to get us through the day, however badly it started. It’ll turn your life Sunny Side up. Another item picked up by my husband. He loves the shiny gold glitters. 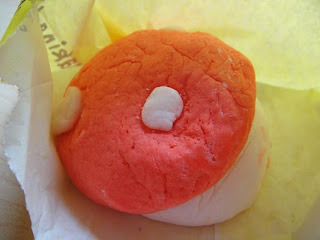 Creamy Candy Bubble Bar – Sweet, frothy and fluffy bubbles that smell like custard creams. What a delight it is to have a bath in the equivalent of a cup of vanilla flavoured, frothy, hot chocolate topped with marshmallows. 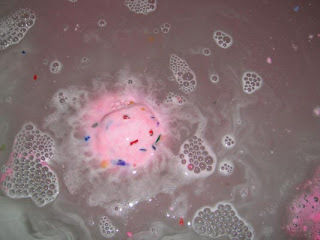 The Creamy Candy bath is like the friend you’re always delighted to see, because he bubbles over with cheerfulness no matter what life throws at him. For days when your friend is busy, it’s time to indulge in some Creamy Candy. They actually have yellow and blue flowers besides this. But of course I picked up the pink one. Haha! Each Peach (And Two’s a Pair) Massage Bar – The one to brighten, lighten and throw off the gloom with a concentrated citrus fix. We make the Each Peach Massage Bar with fruity avocado and mango kernel butters, mixed with our cocoa butter and shea butter base for an extra nutritious, softening treat. Essential oils of Persian lime, red grapefruit, sweet orange and mandarin help to encourage a sunny disposition. Use it to help boost your partner’s confidence. Very reviving: best for mornings. I really need a massage bar for my dry skin. Maybe I’ll start to shower in the morning too. 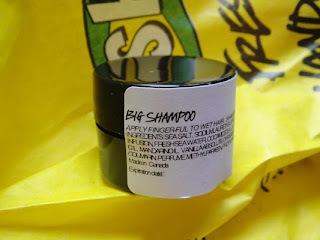 Big Shampoo – Sea salt shampoo for shine, softness and big endowments. This pot of oceanic goodness is 50% sea salt to give limp hair the volume it deserves, with seaweed infusion to soften hair and citrus juices for shine. After using Big, your hair will be bouncing back to life. I got this as a gift with purchase. I’ve never used Lush shampoo before so we’ll see how it goes. I’m still in the hunt for a shampoo to cure my dry scalp. Happy Pill in water! It sells so good and so much fun to watch it melt. The water turned yellow and orange but not so much bubble after it completely melted. 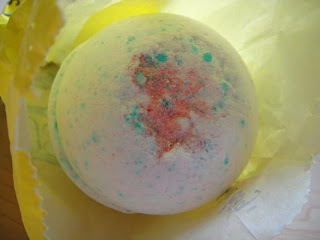 This is the Supernova bath bomb. The British people call them Ballistics. 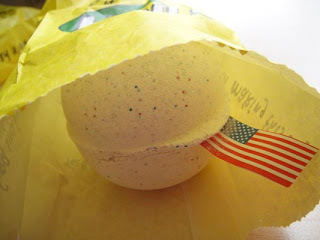 Lots of confetti paper released from the bath bomb. The little ball is spinning bubbling like crazy. One thing I didn’t like this one is that the paper were all at the bottom of the tub. It’d be better if they float around. Anyway, I really enjoyed Lush baths. I think they’re pricy but worth it if you can afford it. I wouldn’t mind using it everyday because it’s just so moisturizing that makes your skin so soft. 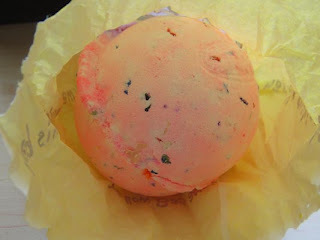 yay lush! omg which lush did u go to that still has the mushroom bubble bar? i really want that!!! lush galore! i can only drool at your haulage, dearie! international shipping is pricey! mine to share how to use that each peach massage bar?